On Friday December 30th China announced a complete ban on all ivory trade, and processing, to be implemented by the end of 2017. The sale and processing of ivory by the first batch of traders will stop by 31st March 2017 and all registered traders will be phased out by the end of the year. It is thought that 70% of the trade in ivory takes place in China. Other big traders are Hong Kong and Japan, although the Japanese deny (wrongly) that there is any illegal ivory in their domestic market and state that they do not need to close it as it does not contribute to the poaching crisis. International attention is now focusing on Japan, which voted against all CITES proposals to protect elephants. 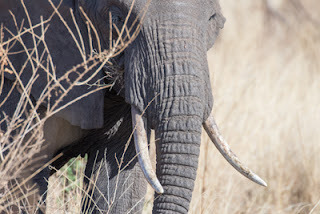 But a recent report by the Environmental Investigation Agency (EIA) found that the nation’s elephant tusk registration system is being subject to fraud and allows for poached tusks from Africa to be sold legally in the domestic market. Hong Kong has announced previously that it will also close its domestic market. This is a massive step towards saving the elephant and for once I cannot praise the Chinese government enough for their decision. However - let's hope that this does not simply mean that the trade will mushroom in other states such as Laos, Cambodia or Burma (Myanmar).